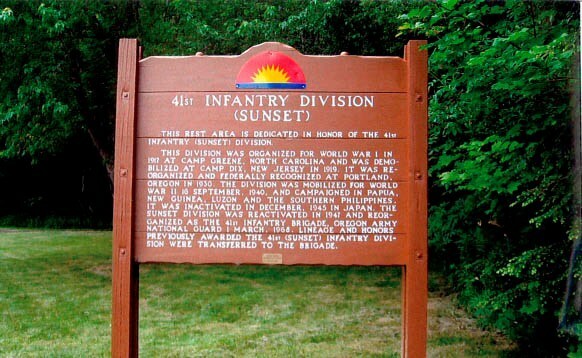 Subject:The rest area was dedicated to the 41st Infantry (Sunset) Division. This division was organized for World War I in 1917 at Camp Greene, North Carolina and was demobilized at Camp Die, New Jersey in 1919. It was reorganized and Federally recognized at Portland, Oregon in 1930. The division was mobilized for World War II 16th September, 1940, and campaigned in Papua, New Guinea, Luzon and the Southern Philippines. It was inactivated in December, 1945 in Japan. 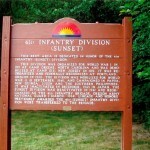 The Sunset Division was reactivated in 1947 and reorganized as the 41st Infantry Brigade, Oregon Army National Guard 1 March, 1968. Lineage and honors previously awarded the 41st (Sunset) Infantry Division were transferred to the brigade.